The Papua New Guinea National Research Institute (PNG NRI) has released its latest report today. The Issues Paper 19, “ASSESSMENT OF MARKET PRICES FOR RESIDENTIAL PROPERTIES IN PORT MORESBY: Do location and property type matter” presents a snapshot of residential property market trends in Port Moresby. The report examined the supply and prices of residential properties in Port Moresby and investigates whether property type and location influence the prices. The article revealed that more houses were available in areas where people with medium to high income live and housing and land prices were higher in and near the central business district than in other areas. It also highlighted that the construction phase of the liquefied natural gas (LNG) project played an important role in driving housing prices up. The report recommended that in order to promote an efficient housing market, it is necessary to make customary land more accessible, reduce import duties on building materials, train more people in property development and support research on uses of local building materials. The report intends to give policy makers a great understanding of the need for a competitive residential property market, and its potential contributions to the Papua New Guinean economy. 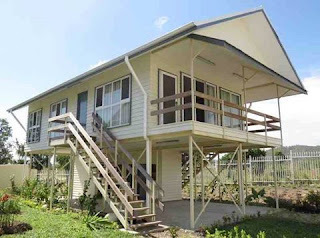 It also contributes to the debate on property development, and a sustainable housing policy in PNG. The article was written by Associate Professor Eugene Ezebilo (PNG NRI Property Sector Program Leader), Ms Lucy Hamago (PNG NRI Project Officer) and Dr Charles Yala (PNG NRI Director).